Attempting to tick off all light lunch locations in a large town like Ipswich is akin to playing Whack-A-Mole on Felixstowe Pier. Origo? Gone. The Orangery? Gone too. Oggy Oggy? Gone gone gone. That was just the Os. So it was no great surprise when the unfortunately named Munch bit off more than it could chew. When your neighbour is the really rather good Caffe Basso, you're going to struggle. Boys against men. 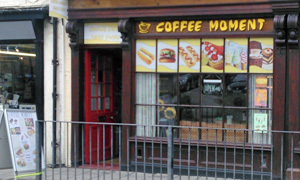 Sprung up in its place is the singularly named Coffee Moment. What have we here? Inside by the window sits Andy at the single table. The sparsely furnished interior has a drinks cabinet, a shelf of snacks and a plethora of Polish sauces. On the counter are cards offering translation services. Brompton Boy is already tucking into his unspecified wrap. I'll try one of the odder choices on the menu: meat dumpling, please. Sorry, we don't have today. OK, a panini. No, awaiting delivery. (Feels like we're back in the early days of Honey & Harvey.) Sausage? Yes. I'll bring over. Within a few minutes, my deli-style sausage arrives with a handful of onion rings and four cucumber and tomato slices. Presented on a paper plate, the plastic knife doesn't last the distance. It's all a bit weird, though the meat itself packs some taste. Straight onto a pre-packed dessert of a very light cherry cheesecake -- nice -- and an OK coffee of the type "latte macchiato". We were there for nearly an hour and nobody else entered or left in that time. Possibly this is a pop-up Polish eatery. I give it until July. If it was a car -- FSO Polonez Atu. If they were passing by -- Liev Schreiber.